New! This post is also available on our digital magazine, on page 62. Great travel experiences are not just about what you see, but also what you experience – and with whom you experience those special moments. When travelling to England, experiencing a proper afternoon tea, or a taking a lovely cream tea break should be on your to-do list. 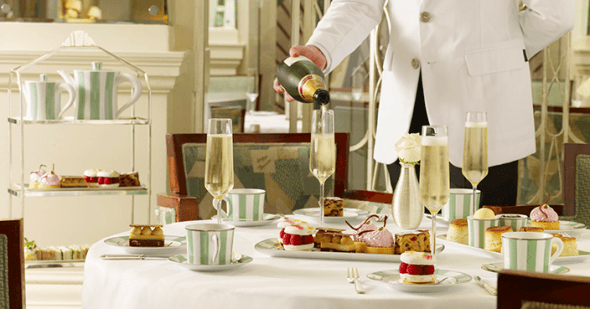 London is the place to enjoy a proper afternoon tea, cream tea, high tea – or my favourite, the champagne afternoon tea. The traditional afternoon tea became popular in 19th century and was intended to be a light meal around 4pm – between the lunch and the dinner, which used to be served around 8pm at the time. This tea comes with both sweet and savory bite size treats, usually savory finger sandwiches, maybe quiche, scones and cakes or petit four. The lovely champagne afternoon tea is just an extension of the traditional tea, where a glass of champagne is serve before the tea. If you like champagne, then a tea option with free champagne refills is what I’d recommend for you. If you would like to experience one of the classic and famous traditional afternoon teas in Claridge’s , Dorchester, Savoy or the Goring Hotel might be the thing for you. The Ritz is also another classic favourite for the tourist, but it’s afternoon tea rating has been on the decline. 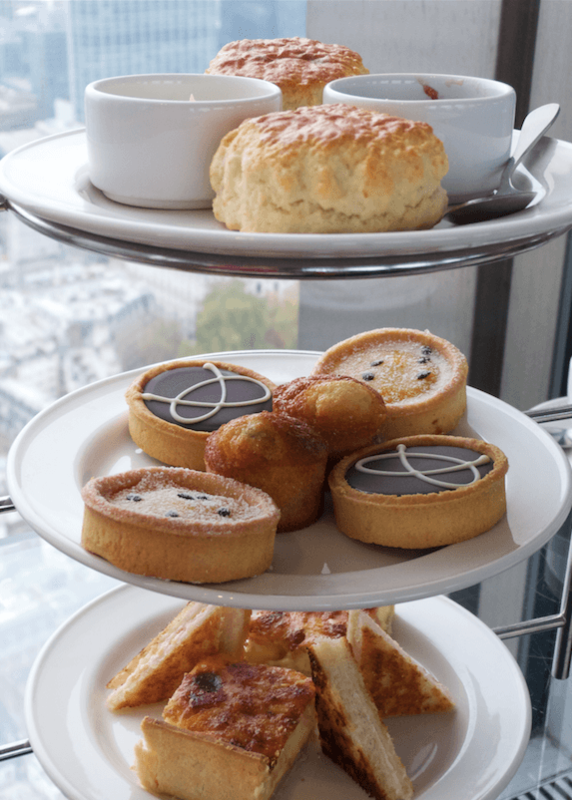 If you are looking for a different kind of afternoon tea experience, then Vertigo 42 might be best suitable for you – you’ll get a sweeping view over London (window seating only!) with your delicious champagne tea. 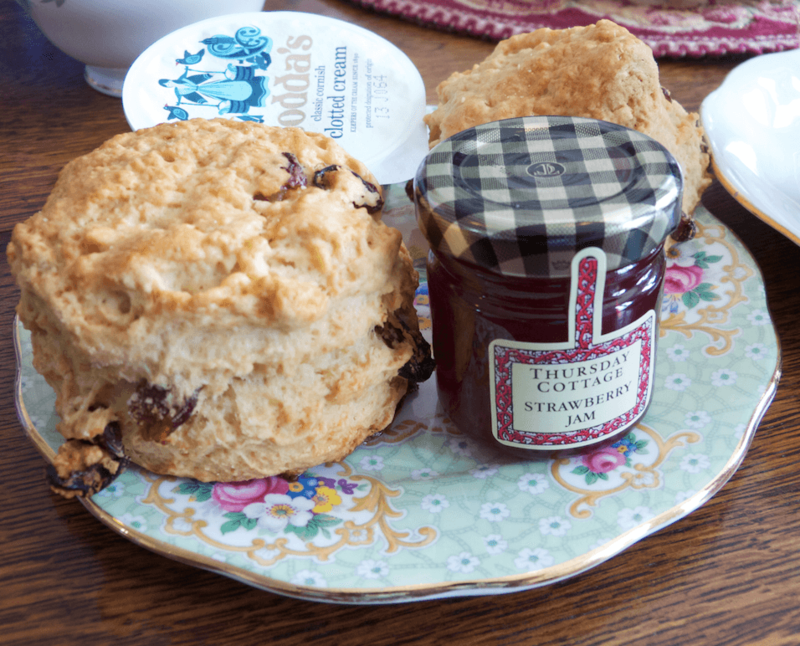 Cream tea is the simplest of the teas – it’s more like an afternoon snack: basically a pot of tea and some scones. Normally there are condiments to go both with tea (milk and sugar) and jam, butter and clotted cream, possibly also lemon curd for the scones. 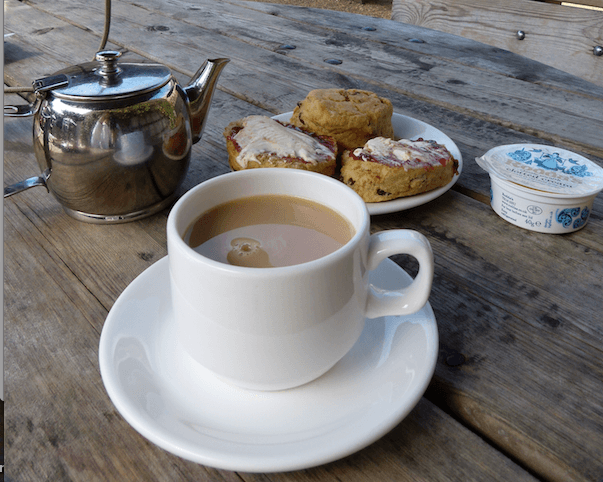 Most cafes will offer this, and if you travel outside London and visit some local castles and gardens, a cream tea is the perfect way to finish off a lovely afternoon in the countryside. The question, whether to spread first the jam or the clotted cream on the scone is an interesting one,a bit like whether you first pour the tea or the milk into your cup. The clotted cream question goes back the origin of the clotted cream, or rather creams: Cornish and Devonshire cream. It seems to be unclear where clotted cream originates, but it’s on of the two regions mentioned above: people from Cornwall spread first the jam and then top with the cream, whereas people from Devon do it the other way round. So there is no right and wrong etiquette for the clotted cream. I have tried both ways – and prefer to spread first jam and then add as much clotted cream as possible! There is one more tea concept to cover, which isn’t really a tea concept at all: the high tea. The name high tea is often used interchangeable with the afternoon tea, but high tea actually means the same as what most people in England call tea-time: the dinner. Whereas an afternoon tea was a social event for the upper class, high tea was a necessary evening meal for the working class consisting of a mug of tea, bread, cheese, vegetables, and occasionally also meat. Therefore places that nowadays offer high tea normally include in the meal savory items such as pies, omelette or English muffins. Pingback: 36 Unique Things To Do in London that aren't on the tourist trail! Reeta, one of my pet peeves is seeing afternoon tea referred to as high tea – thank you for not doing that! I’m constantly trying to educate people about the differences, and you’ve done a wonderful job of that here.